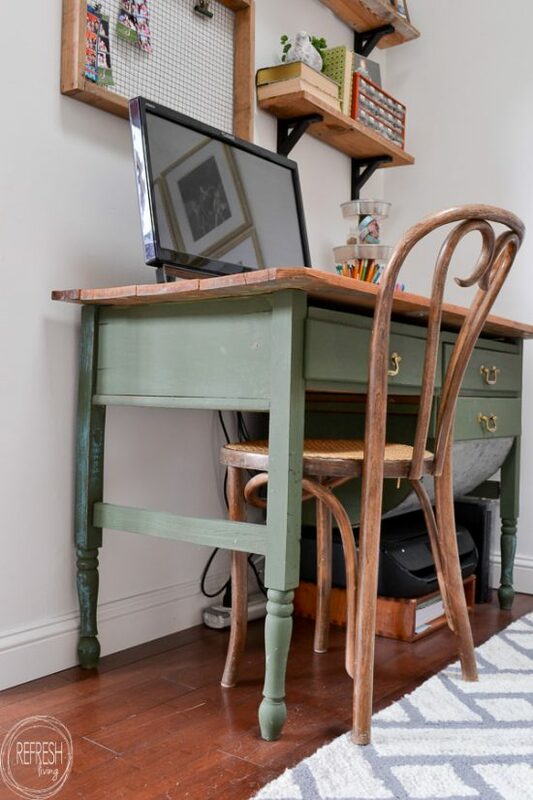 This antique possum-belly baker’s table with a broken drawer was the perfect candidate to be refinished into a unique desk. Using milk paint gives it authentic green finish. This post is a special one. 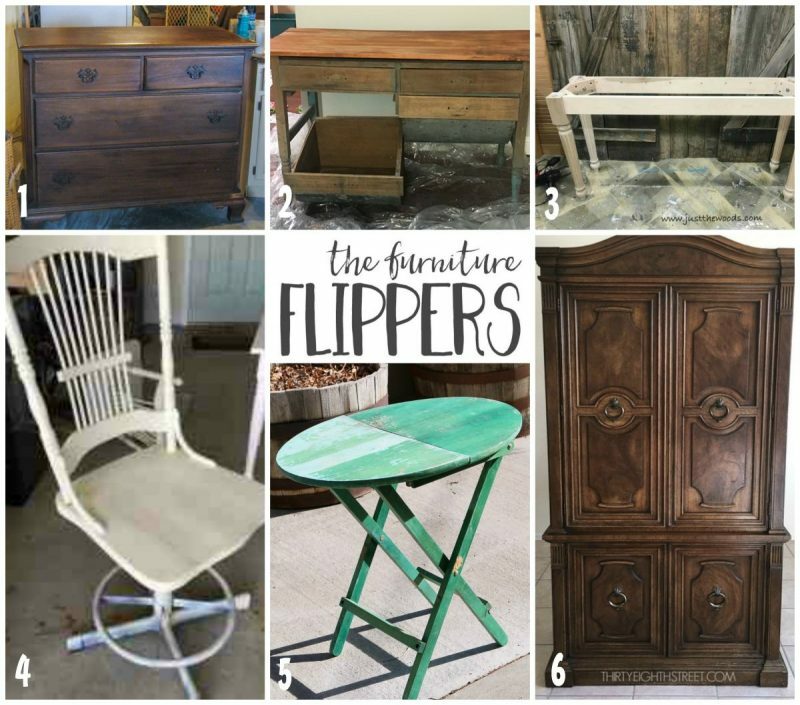 First, I’m sharing one of my ultimate favorite furniture transformations to date, AND it’s the first month of a new monthly furniture refinishing series I’ll be participating in with a few other super creative furniture flippers. 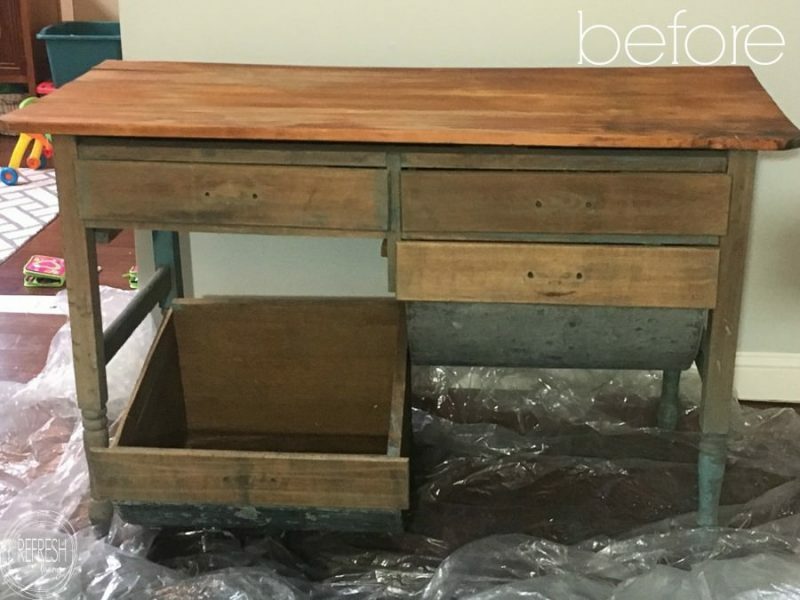 After I share my latest furniture project with you, check out the other projects for some inspiration on your future furniture refinishing projects. So, when I saw this possum-bellied baking table at an estate sale, it caught my eye right away. I gawked at it for awhile, but I had no idea where I’d put it or how I’d use it, so I walked by it, multiple times. Finally, on my last pass through before checking out, it struck me. I could turn this into my desk!! Thank goodness that drawer was broken and laying on the ground, because I don’t think I would have thought about slipping a chair into that opening if it had been in tact. 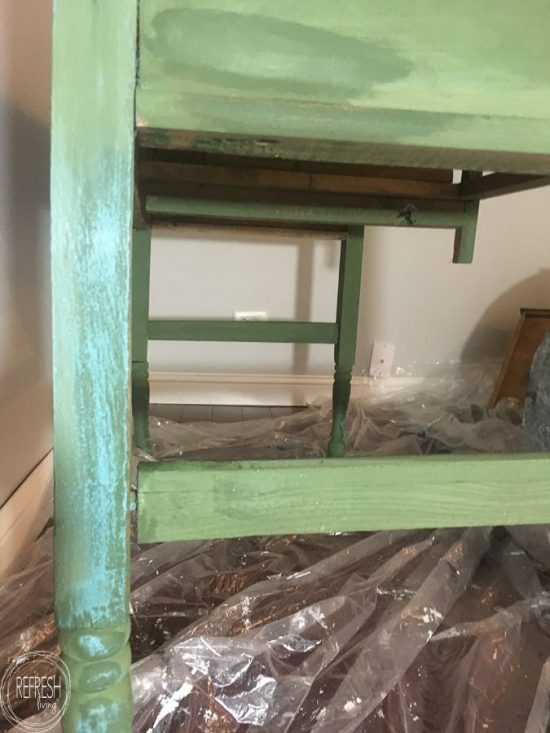 Because the desk had been sanded down to the natural wood in most places when I bought it, I knew it would be the perfect candidate for milk paint. 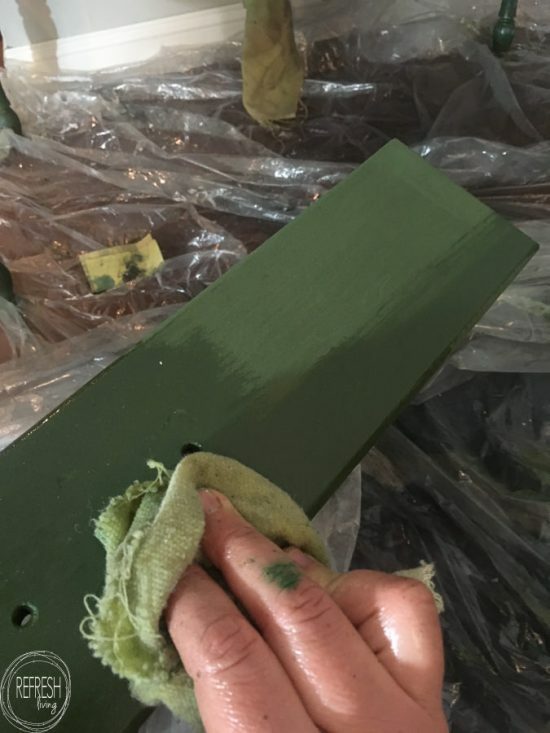 I love to use milk paint on unfinished wood, because it actually penetrates into the wood, and gives it the look of how authentic antique pieces were once painted. 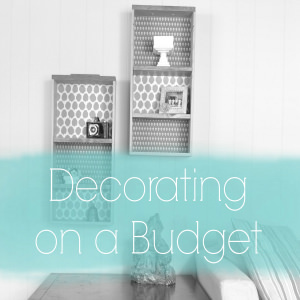 If you’re interested in learning more about the best kind of paint for painting furniture, you should check out this post where I describe my favorite uses for four different types of paint (milk paint being one of them). I mixed together 3 parts Miss Mustard Seed Milk Paint in Boxwood and 1 part Artissimo to darken it up a bit. There were a couple of places where some turquoise paint was still on the legs of the table and I decided I wanted to still show some of this original paint. I just put a little bit of hemp oil over those spots and painted the milk paint right over it. Once the paint dried, I sanded away some of the green to reveal the turquoise underneath. After everything was painted, I decided to use hemp oil to finish off the desk. Now, this topcoat is not permanent, and needs to be reapplied every several months, but I love the natural finish it gives to the desk. I can always decide to add a more permanent topcoat if I get sick of reapplying. Some gold pulls finished off my new desk! Now, I just need to figure out what to do with the other flour drawer. I just can’t get myself to throw it away, but with it’s curved bottom and large size, I’m a little stumped on what to do with it. The top clearly is not original to the piece and was added at some point. To update it, all I did was sand it down and then added a couple of coats of hemp oil to bring out the natural beauty of the wood. That flour drawer needed some major clean up, too. There was sticky, moldy bits of flour still stuck in the drawers! Thankfully, it all cleaned up nicely and was well worth the work. 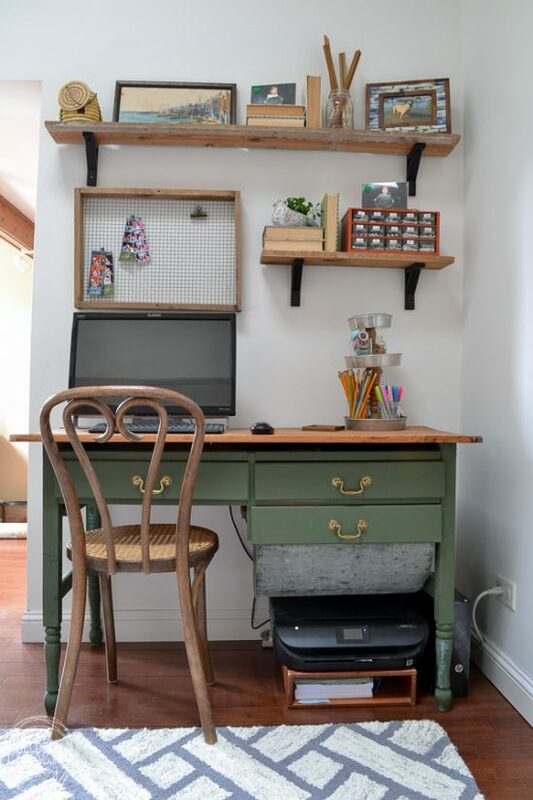 Although my new desk is fun, so is checking out inspiration from other creative furniture refinishers! 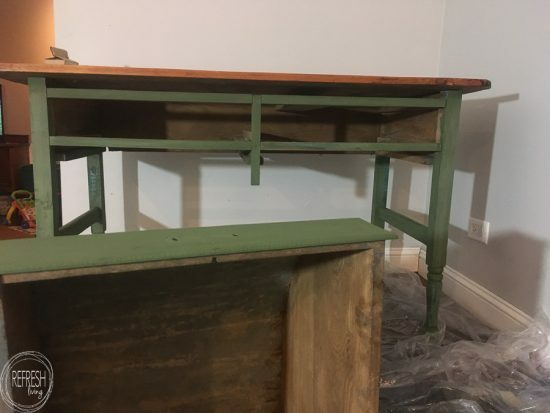 You can read all about the ladies in our Furniture Flippers group here, and then take a look at how their projects turned out below. 1: Two-Toned Dresser from Lovely Etc. 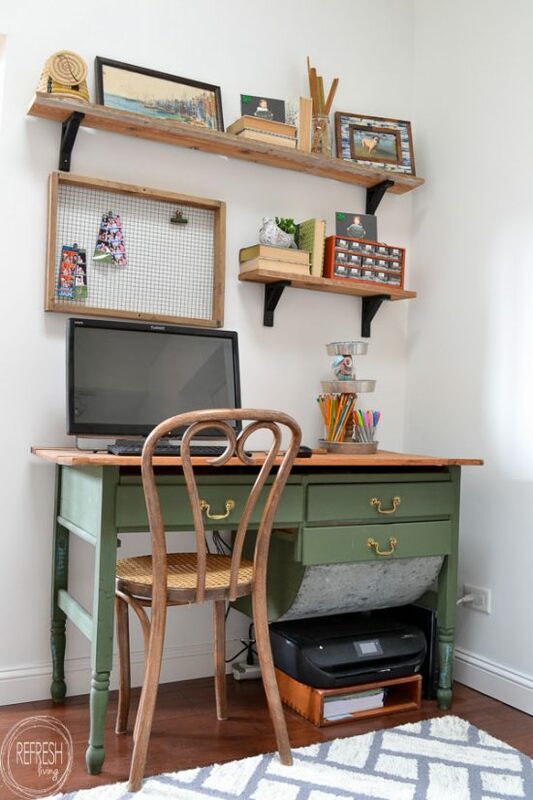 You can find all my other furniture refinishing projects here, or take a look at the rest of our home office that I designed for under $100. That is not only an awesome score, but you rocked the makeover. Yay!! Thanks Larissa! It was so fun and now I just love the piece. this was such a hot mess. I love the save, It looks great now! Hehe – seriously – it was a hot mess. I’m so glad it has a second life now! It’s gorgeous!! 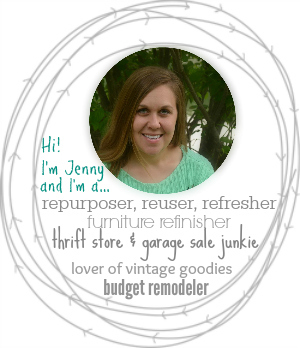 Love that green and I’m tending more and more towards some color in my home! Thanks Katrin! I was a little worried about the green to start, but I’m so glad I did it! What a fabulous transformation. Pinned! I absolutely love, love, love, this makeover. The color is perfect too. I’ll be Pinning this post. Thanks for sharing on Sunday’s Best. I’m looking forward to seeing more of your projects, and thanks for Sharing on Sunday’s Best. This is crazy amazing! Love the color choice too. 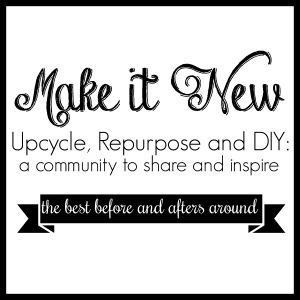 Thanks for sharing your post at the Inspiration Spotlight party. Pinned, and sharing. Cheers! See you again soon. This is MARVELOUS! I love baker’s cabinets–I have an oak one that belonged to my mom, and it’s one of my prized possessions. But now, if I ever happen upon a beat-up one, I’ll have an awesome idea of how to repurpose it!